The 2016 Fabtech Trade Show and Conference was a three-day event held from November 16-18, 2016 at the Las Vegas Convention Center, Nevada. Fabtech, the North America’s largest show in the metal forming, fabricating, welding and finishing industries, attracts the highest quality audience in the field of aerospace, automotive, construction, energy, oil & gas or other transportation. The 2016 show featured 1500 exhibiting companies and a total of 31,110 people attended from over 120 countries. Moreover, 62% of visitors attend no other show and go to Fabtech exclusively! 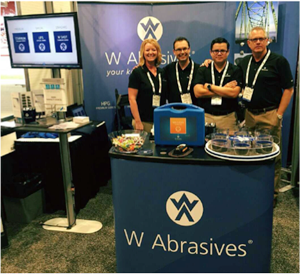 Members of NAO sales team of W Abrasives chose Fabtech to promote the W Abrasives brand and products to the Finishing industry and to remind that W Abrasives is a key player to the abrasive world. available and handed out to visitors. It also offered visitors the chance to see and touch the material. The technical team presented the WA Clean technology. They used the unit in demonstration and explained as to how the WA Clean technology can benefit our customers. Several people showed positive interest and expressed that the WA Clean device was something they would be able to use and consider for purchase. 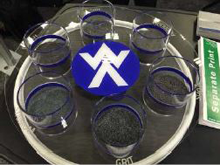 Attending the Fabtech Trade Show and Conference allowed to strengthen the notoriety of Winoa as well as W Abrasives its leader brand, in the Fabricating, Welding and Finishing industry.